For ridge gourd / turai kadhi, oil is tempered with few whole spices. Ridge gourd is peeled and chopped into small pieces and fried in oil till they cook. Mixture of besan / gram flour and yogurt is prepared and cooked along with ridge gourd. 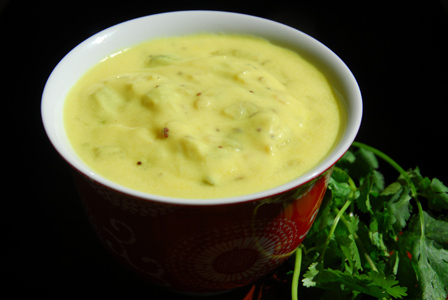 Serve ridge gourd kadhi with steamed rice or with roti. Peel off the thick skin, wash, remove ends and chop the ridge gourd into small pieces. Whisk yogurt with besan and salt into smooth paste adding around half a cup of water. When mustard seeds start spluttering, add green chiles, chopped ridge gourd and salt. Cook covered on low flame till ridge gourd is soft. Take a big tablespoon of ridge gourd mixture and mix with the whisked yogurt mixture to lower the temperature of the yogurt. Then stir in the yogurt mixture in to the pan with cooked ridge gourd. Cook on low flame till yogurt besan mixture thickens or until raw smell of the mixture is gone. Adjust any seasonings if required and remove from heat. Garnish with cilantro if desired and serve ridge gourd kadhi with plain steamed rice or with roti. Notes: Make sure ridge gourd is cooked well before adding the yogurt mixture into the pan. Suggestions: Vary the consistency of the dish with besan / gram flour. If the yogurt gravy feels raw, cook the mixture on low flame for couple more minutes or until done. Make sure not to add cold yogurt mixture into hot pan. Variations: Finely chopped onion can also be added along with ridge gourd. Other Names: Ridge Gourd Kadhi. 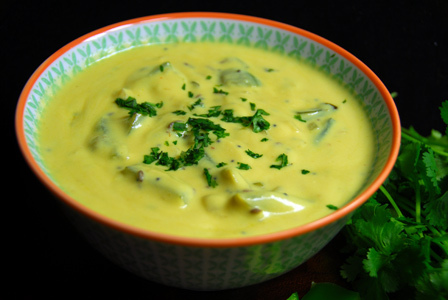 For okra kadhi, oil is tempered with few whole spices. Okra / bhendi is chopped into circles and fried in oil till they turn brown around the edges. 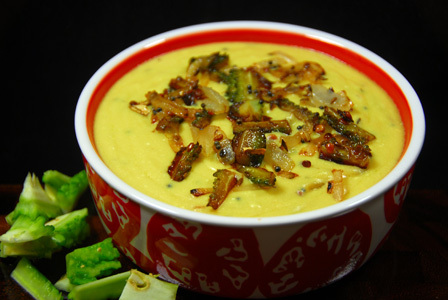 Mixture of besan / gram flour and yogurt is prepared and cooked in oil before adding fried okra. Serve okra kadhi with steamed rice or with roti. 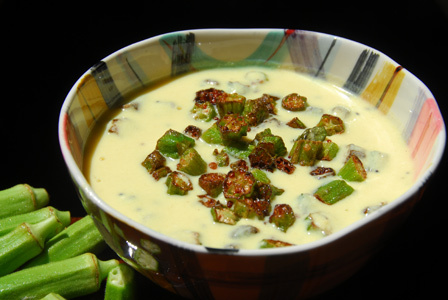 Makes: around 4 Servings of Okra Kadhi. Okra / Lady’s Finger 20 app. Wash thoroughly and pat dry okra. Remove ends and chop okra into app. half inch circles. Heat oil in a pan, add chopped okra and fry till okra turns brown around the edges. Remove the fried okra onto a plate. Lower the heat, add yogurt besan mixture and turmeric powder. Cook till yogurt besan mixture thickens or until raw smell of the mixture is gone. Stir in fried okra and boil for a minute and remove from heat. Garnish with some fried okra and serve okra kadhi with plain steamed rice or with roti. Notes: Make sure okra is fried well. Neither too crisp nor too soft. Suggestions: Vary the consistency of the dish with besan / gram flour. If the yogurt gravy feels raw, cook the mixture on low flame for couple more minutes or until done. Variations: Finely chopped onion can also be added along with okra. Other Names: Bendakaya Majjiga Pulusu, Okra Kadhi. Fenugreek leaves are fried in tempered oil along with onion and green chiles. Yogurt is whisked with besan / gram flour and this mixture is added to the fenugreek leaves and cooked on low flame till the flavors develop. Fenugreek leaves kadhi is rather thick and is served with steamed rice. Makes: around 4 Servings of Fenugreek Leaves Kadhi. Wash, remove stems and separate fenugreek leaves. Whisk together yogurt, besan and salt thoroughly with half a cup of water. When mustard seeds start spluttering, add onion and green chiles. Fry till onion turns translucent, add the washed fenugreek leaves. When fenugreek leaves wilt and start to crisp up, add whisked yogurt besan mixture, turmeric powder and salt. Boil the whole mixture on low flame for around 5 minutes for the raw smell of the besan to disappear the flavor of the fenugreek leaves to penetrate. 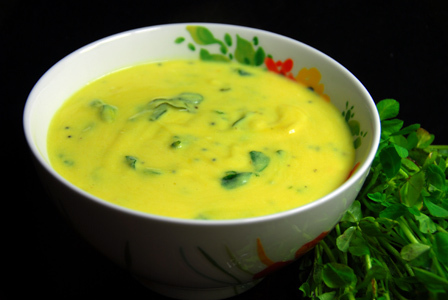 Serve fenugreek leaves kadhi with steamed rice and dollop of ghee. Notes: Make sure not to chop the fenugreek leaves else the bitterness gets worse. Suggestions: Make sure to adjust the consistency of the kadhi with water. Variations: You can also check other kadhi recipes here. Other Names: Fenugreek Leaves Kadhi, Menthi Kura Majjiga Pulusu, Methi Kadhi. Suggestions: If the yogurt mixture is too thin, stir in some more besan to get the right consistency. Besan acts as a thickening agent. Variations: You can also char the bell pepper by placing in oven till the skin turns black and then chop into pieces. Other Names: Capsicum Kadhi, Bell Pepper in Yogurt, Butta Pacchi Mirapakaya Majjiga Pulusu, Simla Mirchi Kadhi.